Hey there! We’ve had a gorgeous weekend here in Alabama and I was able to get out and enjoy it. 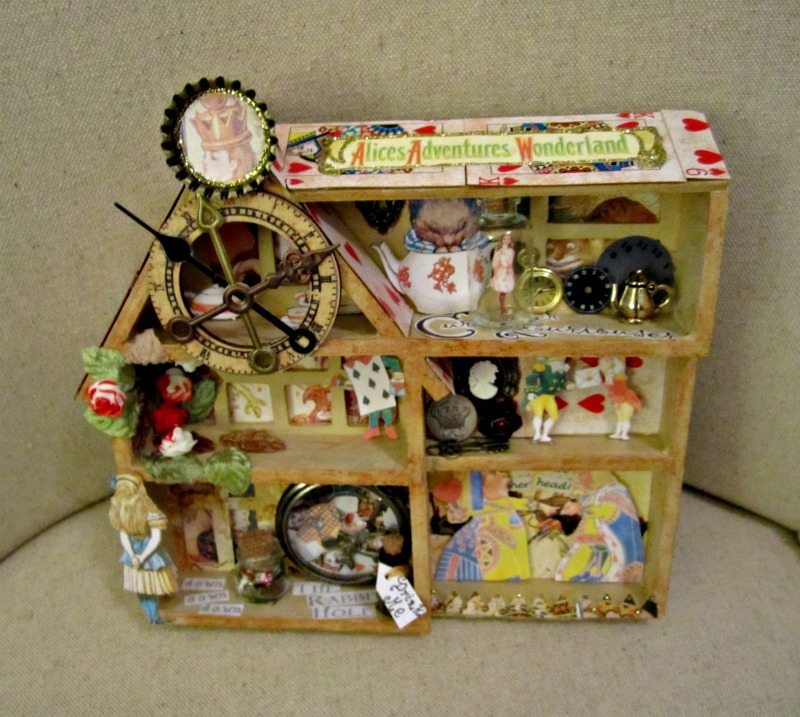 I did spend several days this week hidden away in the playstudio with Veronica Mars DVDs and finishing up Alice’s Curiouser and Curiouser Shoppe for the Altered Alice and Alpha Stamps Design Challenge. If you’ve ever wanted to play around with an Alice in Wonderland theme, now is the perfect time as all the Alice in Wonderland components are on sale at Alpha Stamps AND this challenge is anything goes so you can create whatever inspires you! I found this unfinished wood house on eBay and knew it would be perfect for something. 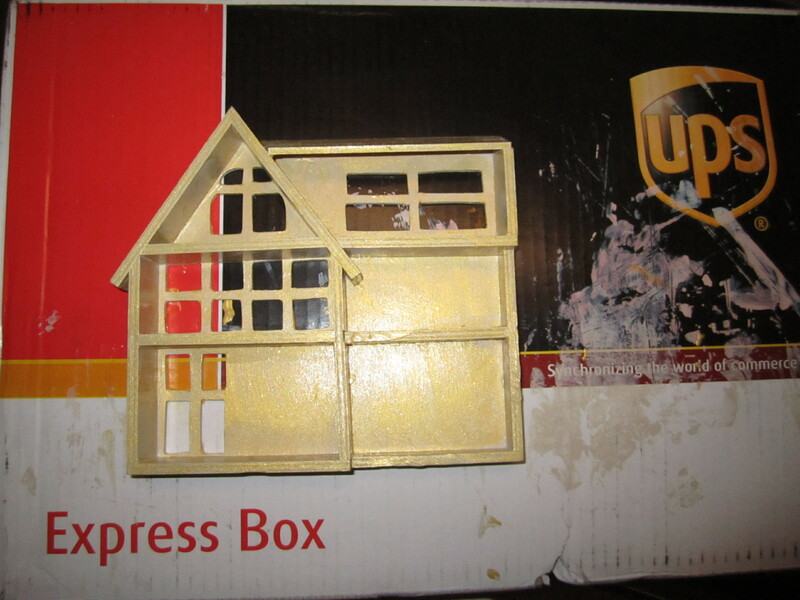 To paint it, I mixed a creamy beige paint with an acrylic paint stain and covered the house. After it dried I used a gold metallic paint, also mixed with stain, to cover it and applied a layer of Tim Holtz Rock Candy Distress Crackle. Because I am impatient and didn’t want to be late for this very important date, I used a hair dryer to speed up the crackling and drying. (My husband walked in as I was blow drying a small wooden house in the kitchen sink and said nothing. He’s become unfazeable–which is disappointing.) I used a sponge to apply some Tim Holtz dye to the top of the crackles. I used quite a few of the Alice in Wonderland Collage Sheets from Alpha Stamps and I love that they are available digitally. Because Leslie is amazing, they always arrive to my inbox super fast so I can start printing and playing. Sheets I used include Tenniel’s Alice CS, A Large Blue Caterpillar ATCs, Alice & Cards CS, Words CS, Queen of Hearts 3 CS, Alice Characters CS, Alice The Trial CS, Mad Hatter’s Tea Party Paper Dolls CS and the I Wonder CS–I think that’s it. To cover the roof, I used a deck of mini playing cards and pulled out the heart cards. I brushed them with Tim Holtz Distress Stain in Vintage Photo and then cut them to fit. There’s so many little things that I used here and there. The velvet leaves along with some plastic white roses created a workspace for a frustrated/terrified member of the Queen of Heart’s Card Army while the Frog Footman and the Fish Footman exchanged correspondence amidst some buttons and keys. A tiny paper Alice is tucked into a 1.5 inch bottle and, can I just say, it was such a pain to get her in there but I am really pleased with how she turned out. I cut her out from the I Wonder CS, leaving a little bit of paper under her feet to create a tab and wrestled her in there with tiny tweezers, using the end of a skinny paintbrush to press her glue dotted tab in place. 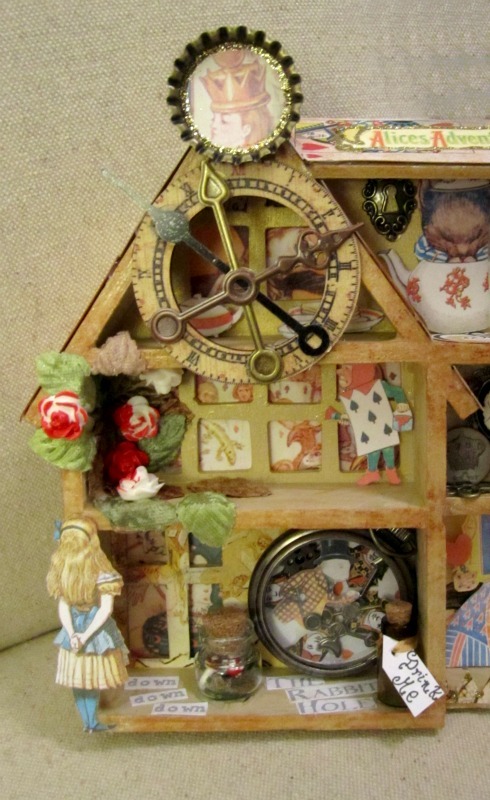 There’s also some metal clock faces, pocket watch brads and a hinged lid teapot charm. 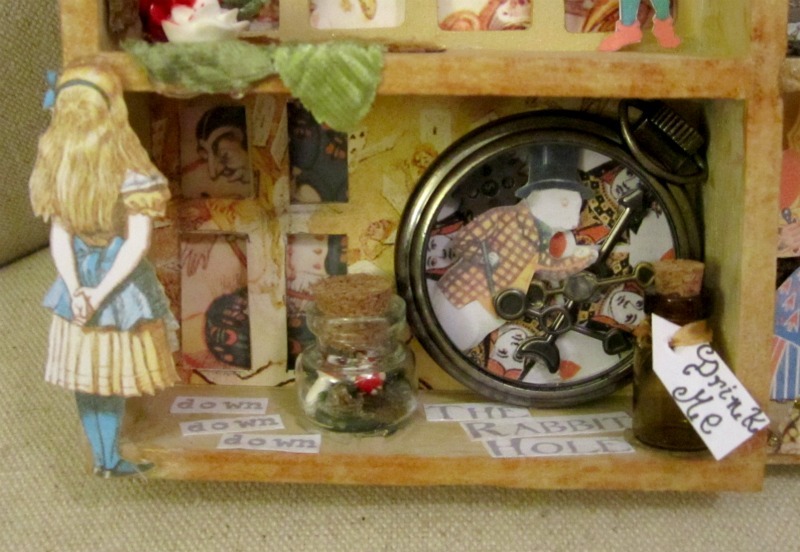 I was stuck on the idea of the White Rabbit and his pocket watch so I filled a faux Pocket Watch with an image from the Red Queen CS and added the Rabbit himself, all decked out, from the Alice Characters CS. To add dimension, he is held in place with some adhesive foam. Watch hands and a tiny gear round out the rest of the components. I must say, it was fun losing myself in Wonderland while I finished up this project and now am only left with one question: how do I want to alter Alice next? How are YOU going to alter Alice? The supplies are on sale at Alpha Stamps through May 26 and the Altered Alice Challenge deadline is May 25 . One lucky winner will receive the Alice’s Adventures Rubber Stamp Set and EVERY entrant will receive the brand new White Rabbit ATC Collage Sheet. So grab a treat, arm yourself with Alice and take a tumble down the rabbit hole to Wonderland. Take time to sip a spot of tea and snack on some spiced comfits and make sure you check out other posts and projects on Altered Alice as there is so much to see and be inspired by. Some of my fellow Alpha Stamps Design Team Members are amazingly talented and have unbelievable creations shared. Pop Quiz: anyone know where and in which Alice book, comfits are enjoyed by the characters? Wow! This is amazing! 😀 Thank you for sharing!